GoCD's Analytics plugin provides insights into your entire path to production. It tracks the end-to-end time of your value stream map, and helps you answer questions like "what is the throughput" and "how long will this take to reach the customer" more accurately. Read more. GoCD's analytics plugin gives real time visibility into your pipelines. 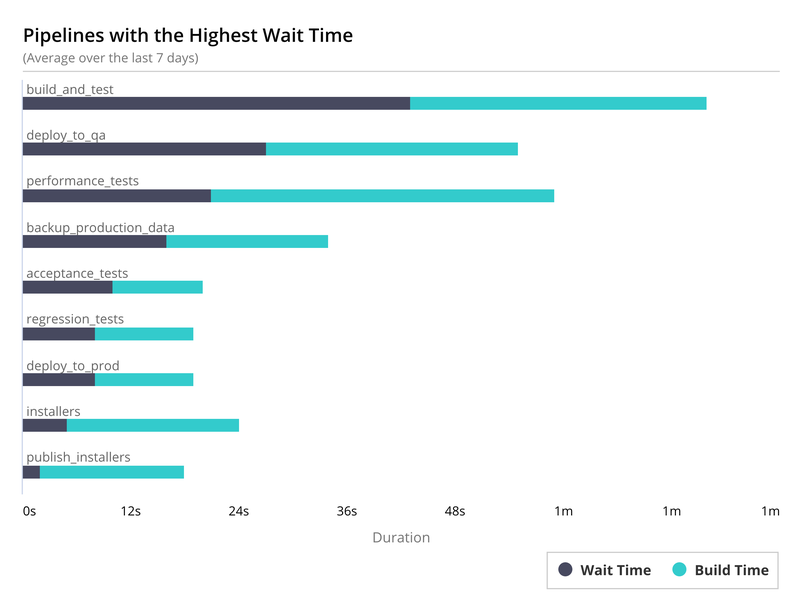 Metrics like pipeline build times, wait times and mean time to recovery are at your fingertips. 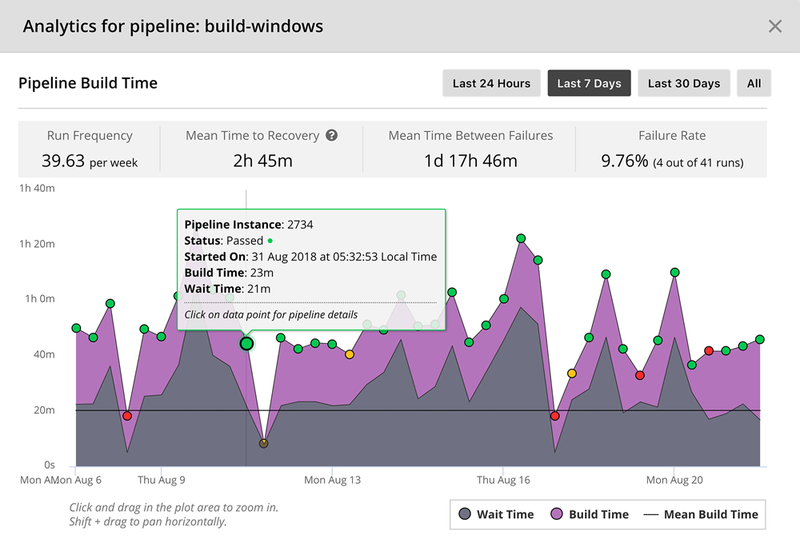 GoCD provides both in-context pipeline analytics and top-level metrics to illuminate bottlenecks in your deployment process and help you streamline it. Which jobs are the slowest? Which agents have the longest wait time? GoCD’s analytics plugin answers these questions and more, helping you optimize your resources for best throughput. 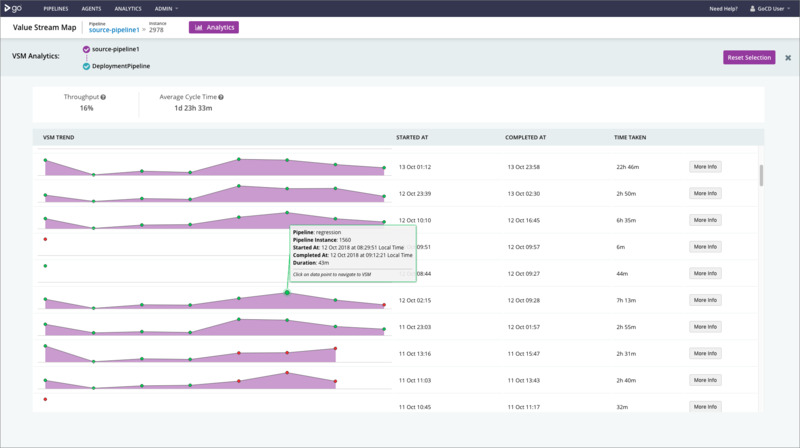 "The GoCD Analytics Plugin provides a great way for teams to assess and improve the effectiveness of their deployment pipelines. Having used GoCD with multiple distributed teams, I know that having rapid insights into timings and utilization for build & deployment can be a big enabler for teams. The GoCD Analytics Plugin is a ‘must’ for serious teams in the enterprise."